I arrived at Trinity’s campus right on time. Our leader had given us a ton of extra time to orient us and to make sure that if anything went wrong, we had buffer. That gave enough time for two interesting events to occur. First, as the other members of my team arrived, some did so accompanied by parents who were anxious to see their son or daughter leave the country for the first time. 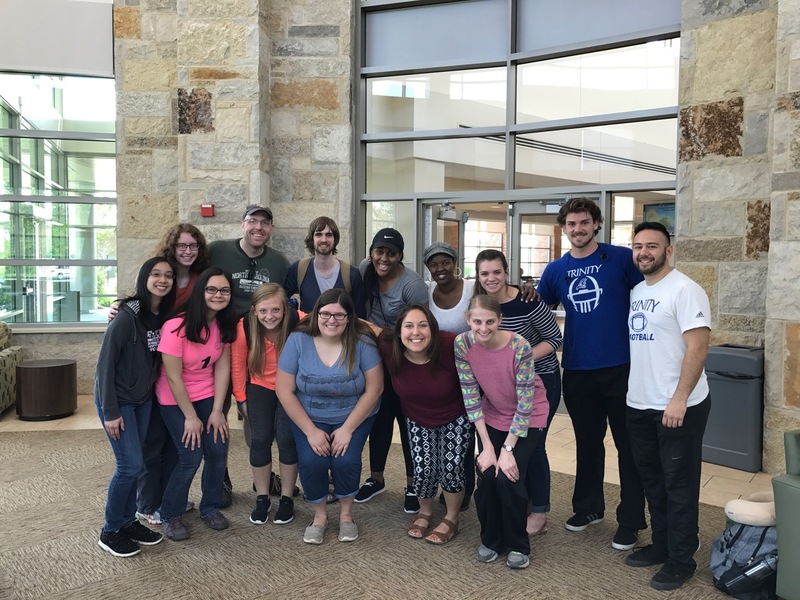 In two separate instances, I got had lengthy conversations with them, reassuring them that we would be okay and that Amanda (our team leader) and I both had significant experience traveling abroad. It felt good to be of use in that way, as an older person going on the trip. Secondly, a number of us got a chance to just walk around campus together and hang out a bit more before embarking on this trip. We left campus for the airport on time as well. It took us forever to get through check-in at O’Hare and get all our bags checked, but the security lines were short and we went through quickly and easily. We had a bit to eat together (at the food court in Terminal C) and departed on United to Brussels, Belgium. The flight was about 8 hours, and we were in economy, so there wasn’t much leg room. But the plane wasn’t jammed full, so we got to do some moving around and stretching out at least occasionally. Unfortunately, however, I still didn’t get much sleep (I never do sleep well on planes). But I also discovered that I didn’t have a pair of “normal” headphones with me – just the ones that work with the iPhone thunderbird port – so that was a bummer. United didn’t have any to give or purchase, either. So that meant that I didn’t have any access to the extensive movie library on the flight. Oh well. Between reading, chatting with people, working, and listening to audiobooks, I kept busy. I didn’t work on my sermon for Sunday nearly as much as I’d have liked either, but I’m having a hard time getting dialed into that even now (and it’s Wednesday). We arrived in Brussels about 30 min early. Our stop there was very brief, but long enough for me to buy an overpriced pair of earbuds from duty free. But other than that, we had just enough time to shuttle our way to another part of the airport, and take off on the second leg of our journey to Uganda. 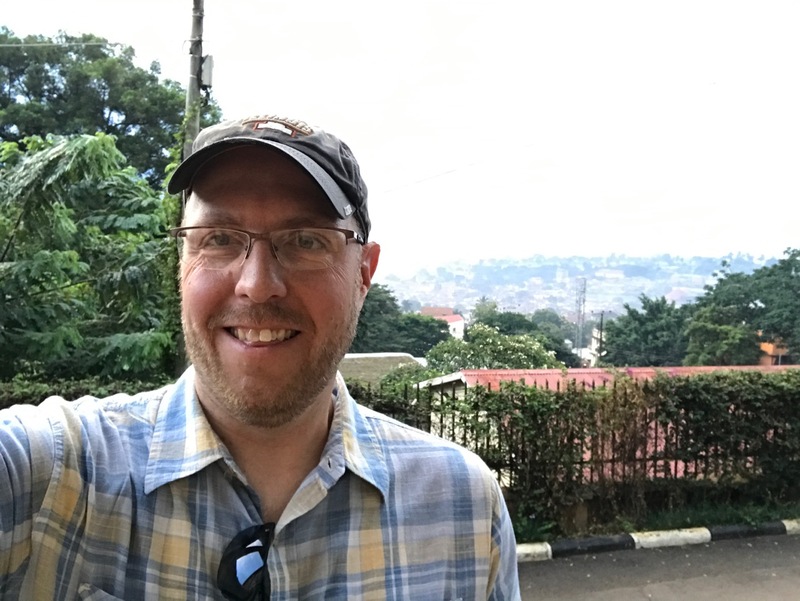 Basically, each flight was 8 hours long, but when you add the time we spent at Trinity, O’Hare, and Brussels, our total travel time was about 25 hours from my front door to wheels down at the Entebbe International Airport in Uganda. Once on the ground there, we went through customs seamlessly, then drove about an hour is crazy traffic on barely paved roads from the Entebbe to the nearby city of Kampala, the capital of Uganda, where we would spend our first night in-country. We stayed at the Namirembe Guest House. It’s a pretty nice place, up on a hill overlooking the city. I took pictures, though there’s a lot of pollution, so they’re only fair. Here’s one picture to at least give you an idea. Upon arrival, before we even checked in, we ate a late dinner at the little restaurant at the hotel, which was really nice. We even ran into a Ugandan guy who had been on the plane with us, which is crazy. Such a small world! They served the freshest, tastiest mango and pineapple ever, along with grilled egg and veggie sandwiches and tea. It made for a good snack before hitting the hay. I was so exhausted, since I slept very little on the plane, so I was eager to get up to the room, let my family know I was okay, and crash. There were no elevators, so we all had to lug suitcases up a couple flights of steps, which was a bummer but not the end of the world. Of course, what that did do is remind me that Faith had encouraged me to get everything down to one suitcase. So, this was the first (but not the last time) I regretted packing as much as I did. The moral of the story is that your wife knows best! That said, I’m not sure how much I really could have lived without in my packing. As it is, I’m discovering a few things like towels, etc. that I wish I had packed, but didn’t. But of well. Next time, I’ll at least make a large check-on bag + a duffle work. At any rate, once to the room, I decided not to take a shower until the morning. The room was warm, and I didn’t want to get clean only to sweat all night. So, the last thing to do was get a message to my family that I was safe, and maybe even chat with them for a few minutes. We’re using Viber for VoIP texting / calling, and Marco Polo as a “video walkie-talkie.” MP is a pretty cool app, to which I was introduced only a few weeks ago, allowing you to record a video and send it to a person or group. They can then record one and send it back. So, it’s not live / real-time communication, but it is a way to do asynchronous video chatting. At any rate, the hotel gave us a password to their Wi-Fi network, so in theory it should have been easy to get connected. Unfortunately, not so much. We couldn’t connect. After spending quite a bit of time (unsuccessfully) trying to send a message, I finally gave up and tried to go to sleep. Unfortunately, as tired as I had been at dinner and while getting everything to the room, the second I hit the pillow I couldn’t sleep – probably a combination of jetlag and anxiety over not being able to contact my family. After 30 min or so of trying to sleep, I finally decided I was going to go down to the lobby and solve the Internet connectivity problem. So, I went downstairs – bashing my head on the top of the low-hanging entrance to the stairs in the process (lol; curse my clumbsy tallness) – and talked to the folks at the front desk. They were fun to hang out with, actually. They joked quite a bit and tried to talk me into switching to the “What’s Up?” app. It took me a while to convince them it was a connectivity issue, not an application issue. So, after emphatically insisting that I wasn’t cool enough to use their fancy international social app, they got me connected to the other wi-fi network – the one supposedly only available in the lobby. And that did the trick. I was immediately able to get Viber messages out to Faith, who happened (by divine appointment) to be getting up just then. So, we got to chat for a bit, I watched a couple Marco Polo videos she had recorded, and then called it a night. Unfortunately, it still took me another ~90 minutes to fall asleep, but at least I finally did. Praise the Lord! It’s amazing to look back on the trip and realize that our travels consumed an entire extra day. Flying against the sun like that is like traveling into the future. The sun came up for us on Tues, 5/16 while we were on an airplane, and set while we were still on an airplane. Absolutely amazing. So, as hard as it is to believe, as I write this, it’s the end of our first full day (Wednesday) in Uganda. So much happened today that I can’t wait to tell you about, but it’ll have to wait. For now, sleep calls again. Let’s just hope jetlag doesn’t revisit me. Thank you, friends and family, for all your love and support. Please continue to pray for me. First, that I would sleep. Second, that my stomach would settle down – it’s been a little angry and rebellious given all the travel and foreign food. And third, and most importantly, that I would demonstrate the light of Christ wherever I go. This entry was posted in Travel and tagged Missions, Uganda. Bookmark the permalink. Praise the Lord you made it safely! Looking forward to continuing to follow your journey online!